Browse All Rivers – Learn about our world-class Canadian and Alaskan rivers. Interactive River Map – Find your adventure using our interactive map of Alaska and Canada. Nahanni River – Experience the magic and mystery of a true Canadian wilderness river icon. Tatshenshini River – Perhaps the wildest and most visually spectacular river in North America. Alsek River – Travel through the world’s largest non-polar icecap. Firth River – A hidden jewel deep in Canada’s north. Experience tundra beauty, wildlife, wildflowers & hiking. Overview – Learn about our multi-day rafting & paddling expeditions in northern Canada and Alaska. Raft and Hike – Not a canoeist? Anyone can experience the remote north from the stability and comfort of our expedition rafts. Canoe and Hike – Find the canoeing adventure of your dreams. Challenge yourself on some the world’s most famous wilderness rivers. 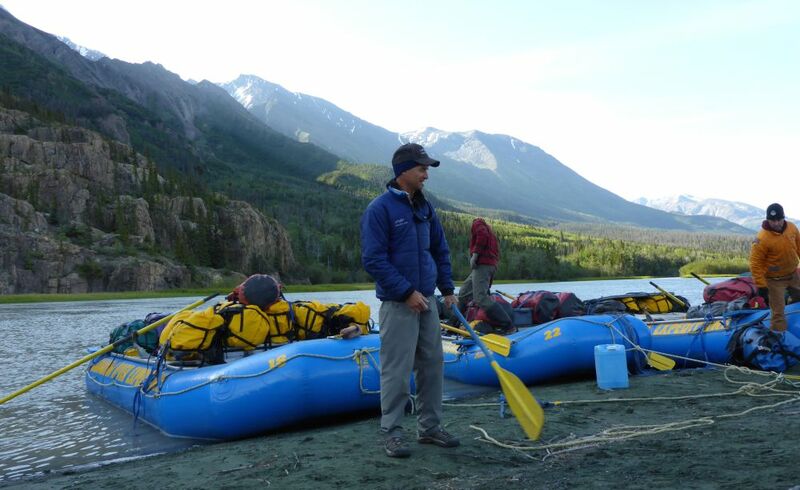 Combo Trips – Our Raft/Canoe/Kayak combo trips make it possible for any skill level and interest to enjoy the Nahanni. For Beginners – Almost anyone can enjoy one of our river journeys in Northern Canada & Alaska. No experience needed. Private Expeditions – We’re specialists in planning and operating customized adventure travel trips in remote wilderness regions. Overview – Learn what you can expect to experience on one of our river expeditions. Daily Routine – Each day of your river journey will inspire stories to tell your friends for years to come. Food & Meals – You can expect to eat as well or better than you do at home—and we do the cooking! River Camping – Camping on the river is one of the great joys of expedition rafting and canoeing. Wildlife & Plant Viewing – The North is rich with some of the most abundant and diverse plant and wildlife anywhere in the world. Fishing – For many of our guests, fishing is the highlight of our river-based wilderness vacations. Overview – Since 1972, we’ve been guiding adventure vacations on 20 of Canada and Alaska’s top rivers. Why Choose Us? – Learn why National Geographic named us one of the best adventure travel companies on earth! Our Guides – Learn how our guides set the standard for river experience and knowledge. Guest Reviews – Some of what past guests have said about us and our trips. Welcome Letter – Welcome to the ‘magnetic north’. Our History – The story of Canadian River Expeditions & Nahanni River Adventures. Awards & Accolades – Learn about our many awards and accolades from over the years. Conservation – Learn about our commitment to the environment. Most Recent – Stay connected to the North. Read the latest stories and news from our blog. Northbound – Your destination for learning more about the places we love to paddle. River Life – Inspiration and stories related to wilderness paddling & camping. Conservation & Science – The places we paddle are rich in biodiversity. Find out how these areas are being protected and studied. Tall Tales – So many of our guides and guests are doing incredible things. Here are some of their stories. News – The latest news about our company, our people & the rivers we paddle. Booking Information – The details you will want to know about making reservations. Reserve Your Trip – Use our online booking form to send us a reservation request. Pre-trip Information – View the details you need to know to prepare for your trip. Frequently Asked Questions – Find answers to our most frequently asked questions. Contact Us – Give us a call or send us an email. We’d love to hear from you. Request a Catalogue – Get a FREE full-colour print copy of our Adventure Package. Getting Here – Some important notes for travelling, including our travel agent contact. What to Bring – Our detailed checklist and helpful notes make it easy. Accommodations – See our list of guest-recommended lodging. Skill Prerequisites – Review our canoe skill prerequisites to help you choose the best river for your skillset. I think I started river guiding in ’84 and the addiction was instant. Over the years I have guided most of the northern rivers we run and I seem to be drawn to the Firth and Alsek continuously. Must be the magnetic north. When I am not running rivers, I operate my steelhead fishing lodge on the Bulkley River near Smithers, BC. Winters sometimes find me chasing sharks on a research ship or bone fishing on the flats. Spring is teaching rescue courses. My favourite memories of river trips are always the hikes. Subscribe to Northern Currents, our monthly email newsletter featuring northern news, events and inspiration. Request your free adventure catalogue and start dreaming about your trip of a lifetime. Since 1972, we’ve been leading premium class expedition style rafting and paddling trips on the top rivers in northern Canada and Alaska.